Irrigation canals are the blood vessels of agriculture, delivering water throughout America's farmland. Pretty soon, they may well deliver a bit of electricity too, thanks to the Hydrovolt micro-generator. The Hydrovolt C2, designed and built by the same-named Washington state company, is a compact car-sized device that sits on a irrigation canal's floor and utilizes the steady, uninterrupted flow of water to power its turbine, which is situated perpendicular to the flow, like a paddle boat wheel. As the wheel turns, it cranks an on-board generator that produces a charge. 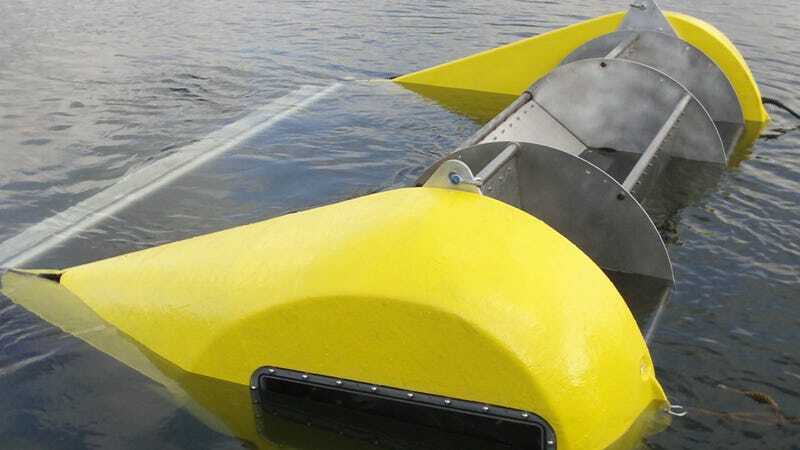 The device is neutrally buoyant so it can generate power on the water's surface as well, without impeding the flow or affecting the water quality. "There are huge regions of the world that are irrigated, where they have built these highways of water," Burt Hamner, founder and CEO of Hydrovolts, said in a press statement. "We've found a way to make a little power off it without any environmental impact." Depending on the rate of water flow, these devices can produce up to 12 kW of energy apiece—not enough to power a grid, but sufficient to light a few nearby homes. And, with a $20,000 price tag, each unit should pay for itself within about five years of service. These turbines are surprisingly versatile as well. In addition to the irrigation canal model, Hydrovolts also has a larger version, the C3, in the works that should produce up to 20kW from the bottom of aqueducts. The company hopes to eventually install these devices in spillways and water treatment plants—anywhere with a steady current.